Last week, my family and I had to say goodbye to our beloved dog, Jenny. 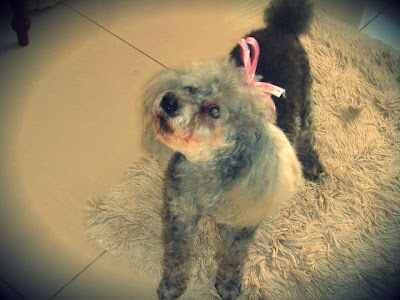 Jenny was 17 years old, and not just a pet but, together with our other french poodle Jessy, a big part of our family. I remember the day I got her. She was just a little black ball of fur and so tiny. I was 10 years old and super excited to get a dog. She slept in a shoe box next to my bed. Well... she slept there for about an hour before she started crying and I secretly picked her up on the bed and she slept with me under the covers. Needless to say, she never went back to that shoe box, and she also never left my side after that. I'll always remember her for being the most loyal companion I've ever had. She used to follow me around everywhere, just in case I was going to sit down and she can take the opportunity to jump on my lap; her happy place. She also didn't hesitate to jump on my lap when I went to the bathroom. She knew no boundaries. She sat next to me while I ate lunch every day, watched Friends with me in the afternoon on the couch, and slept on my bed while I did my homework. She also didn't hesitate to bite anyone who came to close to me. She nipped most of my family at least a few times, and also most of my friends. When I left South Africa four years ago to work abroad, it was harder for me to say goodbye to her than my family. I know that sounds crazy, but at least my family could understand where I was. Jenny and I did catch up on Skype occasionally. My mom has been wonderful taking care of her the past few years. After she became blind and deaf and no longer had bladder control, I know it was a lot of extra work for my parents. But they never complained and took care of her as if she was their little baby. No really, she was wearing baby diapers for the last few months. It's not easy saying goodbye and letting go, but all the photos, videos and memories I have of her, I'll treasure forever. One day we'll meet again and she'll jump into my arms from two meters away like she always did. Rest in peace, my Baba. Awww sorry to hear about your dog hun. SO Sorry to hear about Jenny. I still remember that Sunday I had to go to my parents house to say goodbye to Josh. I cried the whole drive back to Stellenbosch. It's been 2 years now and my heart still breaks every time I think of him. But he was surrounded by love till the end and I know he died a happy doggie. I'm sure it was the same for Jenny! Still miss her so much. Day 56 - A picture of something that makes you happy.